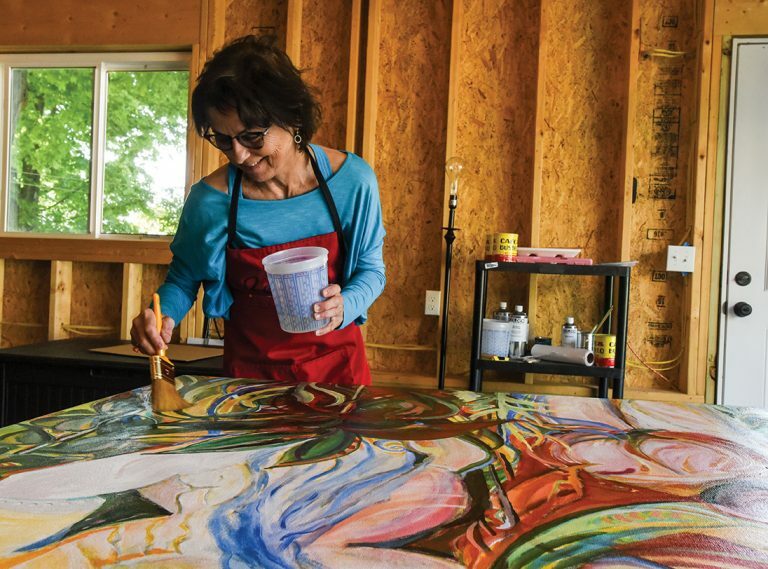 The fusion of art and spirituality is spreading across the north country, thanks to Christine Tisa, a gallery owner in Clayton. Ms. Tisa, an artist, yoga teacher, and seasoned traveler, is sharing her passion for painting Mandalas with local residents. Ms. Tisa has studied art throughout the world, earning her masters in art education at Syracuse University and her masters of fine art in painting at the Rochester Institute of Technology. In addition, she has also studied at the University of Pisa in Italy. In 2003, after spending the winter teaching yoga at Soul Rise yoga in Costa Rica, Ms. Tisa had the idea to bring the Mandala paintings to the north country, an addition to her other forms of painting. The ancient symbol of the Mandala can be traced all the way back to the 4th century in western countries. It is popular in Hinduism and Buddhism culture for representing the universe and larger metaphysical ideas. The standard form of a Mandala is a square with a circle in the center point. It can be used as spiritual guidance and assist in deepening your meditation practice. This type of artwork has more depth than your usual painting class. Ms. Tisa begins her classes by giving background on the practice. She then tells her students to sort through stencils that draw their attention as if they were shopping. After teaching how to find the center of the circle, she begins a journaling activity that allows the artists to open up their hearts and minds to create art that allows them to let go of something or discover a more meaningful part of themselves. “When you journal or are doing anything like these Mandala paintings, you’re really unraveling,” Ms. Tisa said. The activity can be representative of how one relates to their family, their friends, or it help someone realize how much time they should take for themselves and their craft. In addition to her education, Ms. Tisa has taught her craft at the American School in Madrid, along with schools in Costa Rica and Croatia. Ms. Tisa taught high school art for eight years in the Alexandria Central School District, before taking a teaching position with the Utica City School District. While teaching in Utica, she worked with students from many diverse backgrounds, which created an ideal opportunity to teach Mandalas. Ms. Tisa worked with students from Nepal, Sudan, Russia, South American and Thailand. She even donated her time to the Munson-Williams-Proctor Arts Institute, a major museum in Utica, as part of an international art project. She says that this is an art form truly for all ages. She has spent time teaching afterschool programs with children, high school classes, and worked with adults. In one of her recent classes, she taught the managers at Novelis pieces. After retiring from the public-school system, Ms. Tisa moved to the north country in 2016 to open her gallery, Tisa Gallery, at 412 Merrick St. Her art is also displayed for sale at Bella’s Restaurant, St. Lawrence Gallery, River Yoga and The Golden Cleat, all in Clayton. She noted her art gallery, along with several others in the area, are located off Main Street. Ms. Tisa hopes when people travel to downtown Clayton, they will perceive it as a good starting point to explore galleries and other businesses off the Main Street. Ms. Tisa recently traveled to Mexico, where she gathered new materials, such as tile and Mayan designs, for her upcoming Mandala workshops. For people looking to get involved, Ms. Tisa will be holding a class on June 23rd at River Yoga, and others throughout the region over the summer and fall. You can visit the Tisa Gallery year-round to view her other artwork at 412 Merrick St. in Clayton. To sign up for classes, go online to http://tisagallery.com/ or email tisagallery@aol.com.